I've been waiting a long time to write that headline. 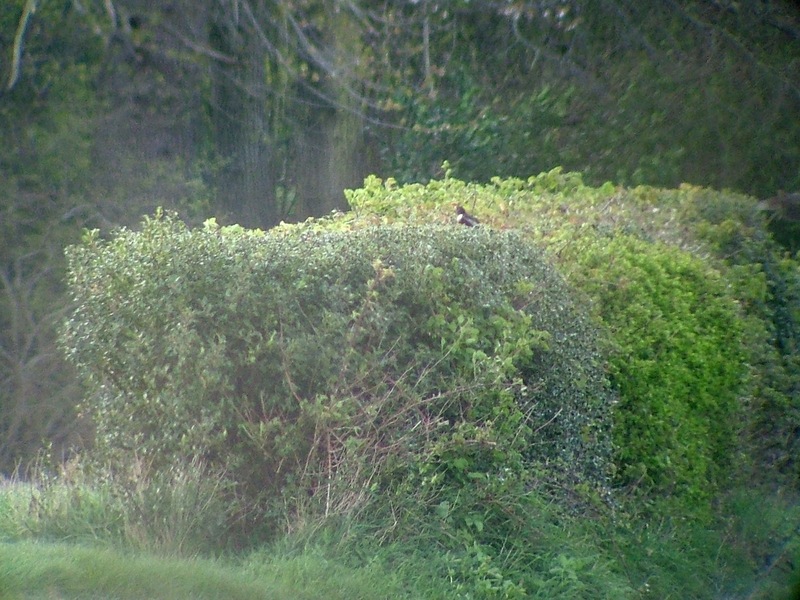 I saw my third different Ring Ouzel of the spring late this afternoon. 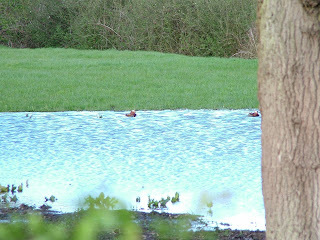 In a howling gale I met up with Ian Jones, who'd seen the male bird first, and David Campbell at Canons Farm. 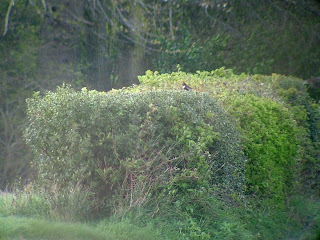 It was distant and views consisted of brief sightings on the ground through a gap in the hedgerow in Bog Field and better views on top of the hedgerow itself, but a Ring Ouzel is a bird I never tire of watching. David believes this is the same bird, with a damaged crescent, that was seen a couple of weeks ago on the farm, so it has stayed for a remarkably long time. Later in the evening, yet another Ouzel, a female this time, was seen in a popular Ring Ouzel haunt, Infront George Field. It has been a brilliant spring for Ring Ouzel sightings across the country, and Canons Farm reflects that with at least six different birds seen during more than a two-week period. 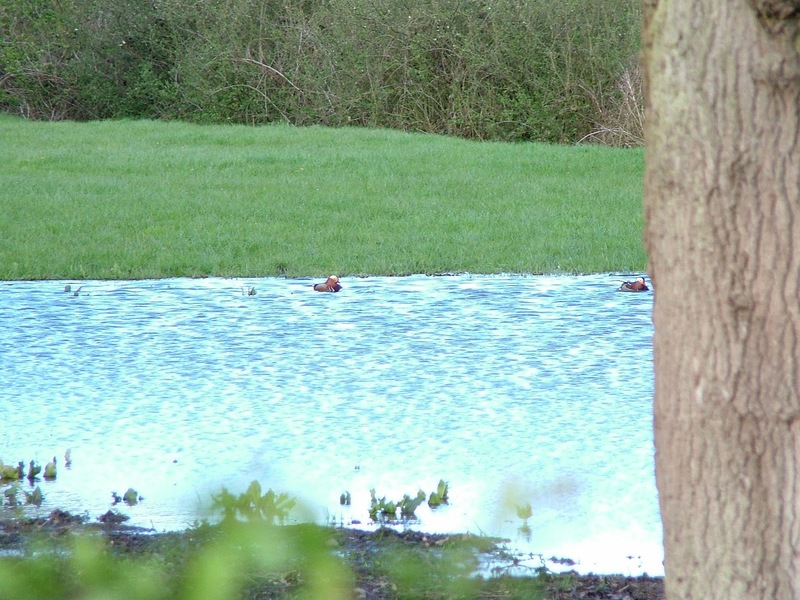 On the way back home I also came across a couple of Mandarin swimming in a flooded area of a field along Rocky Lane, near Redhill. So what else has been happening? Not a lot from my point of view. I did get to see a Common Sandpiper (129) at Spynes Mere on my local patch at Holmethorpe, plus a few House Martins (130) feeding on the Water Colour Lagoons with a number of Sand Martins and Swallows. Most of the real excitement, however, has been happening while I've been working, with Holmethorpe's first Whimbrel of the year seen by Paul Kerry on Monday, which followed on from one seen at Canons Farm by Steve Gale on Sunday. Holmethorpe has also had its first Greenshank (Paul saw this one), Hobby (Gordon Hay), Cuckoo (Paul and Graham James, who also saw a second Whimbrel this morning) and Garden Warbler (also Gordon Hay). 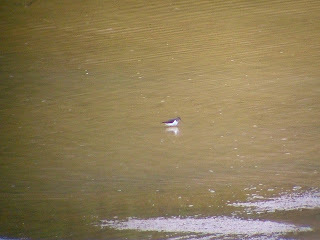 I managed to pop over to the patch this morning and saw my first Common Swifts (131) of the year, four of them swooping over the Water Colour Lagoons towards Mercers Lake, and a couple of Lesser Whitethroats (132) at Spynes Mere. Other areas have had some spectacular sightings. Beddington had their first Corn Bunting this century drop in today, plus plenty of tasty flyovers during the storms this week, including Bar-tailed Godwits, Arctic Terns, Whimbrels, a Black Tern, Grey Plover and Hobby. Staines Reservoir had a notable 68 Arctic Terns on the north basin on Tuesday and 46 Little Gulls the following day. It will also be the first day this year where I get to spend a whole day watching birds. I may not spend the whole day at Holmethorpe – I've a few other places I also want to go to – but if you decide to pay the patch a visit this weekend, I might see you there!